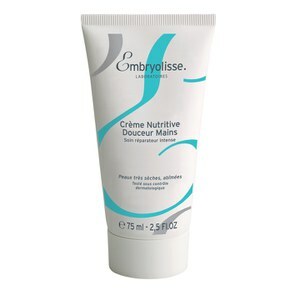 Treat your hands to Embryolisse Nourishing Hand Cream, a nourishing formula dedicated to soothing the skin on dry, damaged hands. Combining a natural blend of shea butter and emollient oils, the hand cream softens and repairs stressed skin whilst helping to prevent premature ageing. Deeply moisturising , the softening cream will leave you with smoother, plumper looking hands. Your hands will be left looking youthful and feeling comfortable. - K.N. Aqua (Water), Glycerin, Paraffinum Liquidum, Squalane, Glyceryl Stearate Se, Cetyl Alcohol, Stearic Acid, Palmitic Acid, Steareth-10, Butyrospermum Parkii (Shea) Butter, Triticum Vulgare (Wheat) Germ Oil, Cyclopentasiloxane, Cyclotetrasiloxane, Allantoin, 1,2-Hexanediol, Caprylyl Glycol, Triethanolamine, Parfum (Fragrance), Dimethiconol, Glyceryl Polyacrylate, Tropolone.